Researchers at the Institute of Pharmacology and Structural biology (CNRS/Université Toulouse III – Paul Sabatier) and the IM-TB/HIV international laboratory, a consortium between the CNRS and the National Scientific and Technical Research Council (Conicet) (Argentina), together with the Center for Pathophysiology of Toulouse Purpan (CNRS/INSERM/Université Toulouse III – Paul Sabatier), have shown that macrophages – which act as host cells for tuberculosis and HIV-1 – join to form nanotubes when exposed to Interleukin-10, a host molecule secreted in the presence of tuberculosis. The abundance of these specific M(IL-10) macrophages in the lungs is correlated with the severity of the disease. HIV-1 particles travel through these tunnel-like nanotubes to infect neighbouring cells and multiply. Using different approaches to inhibit their formation, scientists successfully reduced viral transfer between macrophages, leading to a drop in HIV-1 production. 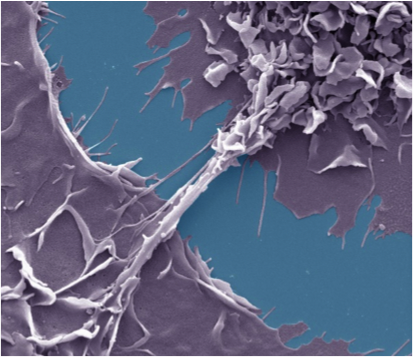 Nanotubes linking two macrophages in humans infected with HIV-1 in a TB-associated micro-environment. ©Shanti Souriant & Renaud Poincloux, IPBS, CNRS/Université Toulouse III-Paul Sabatier. Tuberculosis exacerbates HIV-1 infection through IL-10/STAT3-dependent tunneling nanotube formation in macrophages. Souriant S, Balboa L, Dupont M, Pingris K, Kviatcovsky D, Cougoule C, Lastrucci C, Bah A, Gasser R, Poincloux R, Raynaud-Messina B, Al Saati T, Inwentarz S, Poggi S, Moraña EJ, Gonzalez-Montaner P, Corti M, Lagane B, Vergne I, Allers C, Kaushal D, Kuroda MJ, Sasiain MDC, Neyrolles O, Maridonneau-Parini I, Lugo-Villarino G, Vérollet C. Cell Reports, 26 March 2019. DOI 10.1016/j.celrep.2019.02.091. https://www.cell.com/current-biology/fulltext/S0960-9822(19)30262-3.